New Easy-Release Barcode Label Holder for Reusable Warehouse Totes and Containers | ID Label Inc.
Today’s modern warehouses, distribution centers and manufacturing facilities rely on totes and containers of all shapes and sizes to meet the demands of daily operations. 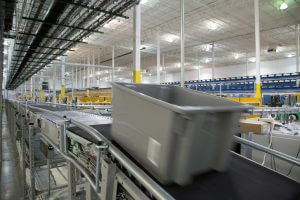 These reusable containers help to organize materials and products during the manufacturing and order-fulfillment processes. Tote Renew™ is a durable, laminated label-holding strip that makes it easy to apply and remove barcode labels for all of your containers. ID Label’s new Tote Renew™ is a durable, laminated label-holding strip that makes it easy to apply and remove barcode labels for all of your containers. With Tote Renew, you avoid the challenge and frustration of constantly scraping off old labels or the mess of stacking new labels on top of old ones. “With our new digital UV inkjet technology and custom design capabilities, Tote Renew labels can feature multicolor client logos, addresses and other information to help brand and identify reusable containers as they’re used throughout your supply chain,” LeBlanc added.